Eastbourne Borough manager Tommy Widdrington says the club’s future is bright after overseeing a tremendous end of season run-in. While Borough are all but out of play-off contention, they have won their last four Vanarama South games in a row and are itching to keep that run going in the two games they have over the Easter weekend. “It has been great both in terms of performances and results,” Widdrington said. Borough host play-off chasers Concord Rangers at Priory Lane tomorrow (Saturday) before a trip to St Albans City on bank holiday Monday. Two wins is the target as Borough look to finish as high as possible. 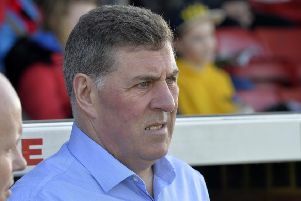 And although the play-offs, while not mathematically out of the question, are seemingly out of reach, the boss is more concerned about long-term planning and insists there are no regrets about the run arriving too late in the season. “Not at all,” he added. “A lot of people just look at the here and now but we are looking to the future. “We almost started the season too well. But we can not look back on the season with any regret, we look at the positives. “You have to plan long-term and hopefully we have a group together now that can be competitive at this level. You need to have a big squad to compete over 42 games of the season. The squad is already starting to take shape for the next campaign with Darren Lok commiting his future to the club this week. Lok has been integral to the recent run and could lead the line again this weekend. The only injury doubt is Jack Evans . Borough v Concord kicks off 3pm, Priory Lane April 4. St Albans v Borough kicks off 3pm, Clarence Park, April 6.